Hope the innovators develop self cleaning windows to go with this house, because the view is soon going to be impeded by salt build up. I suspect window cleaners are going to demand danger money. 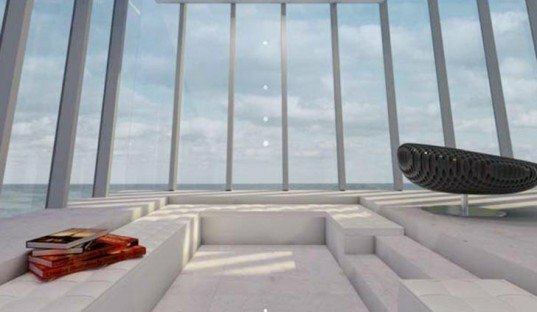 The views would be the same if the modules were stacked on top of the cliff. It\'s certainly useless engineering. Мне эта идея уже лет десять не дает покоя. Только я хотел дом на длинной консоли подвесить и по ней сделать проход в дом. This is pretty close to the worst idea for housing (aesthetically as well as practically as I've seen). Its like a designer dress made of vacumcleaners and pins! it will never happen! Like that idea of living on the edge of the Grand canyon! REALLY???? Plus, Smacks of entitlement being able to wreak a pristine outcrop/ coastline/ view for everybody just so you can live somewhere - how about visiting it like everyone else! Back to the drawing board Chaps! Totally inappropriate location for a structure! This is not the kind of house I would ever feel comfortable in. Concept showing sandstone cliffs is the first mistake. They even included a potential crack in the cliff that would be catastrophic if it broke off. I would just like to remind everyone that this is NOT REAL and will most likely never be real. Concepts like this are easy [and frankly not very creative] it's when you face the reality of actually making it work that true innovation is evident. Then there's the whole other difficult process of convincing someone to fork out the cash for one of these things [quite the limited customer base]. These types of cliffs are inherently unstable. This one in particular looks like sandstone, how could it ever be secured from collapse? Not too many years ago in Oz a cliff like this with an arch collapsed with some folks trapped on the ocean side, near the Twelve Apostles on the Great Ocean Road. I hope they have good lightning for approaching the house in a foggy night; or else, miss the driveway and...kiss it goodbye! This is hideous. Why destroy the wonderful wilderness feel of this wild coastline with this eyesore? They never said it was real actually, quote below. 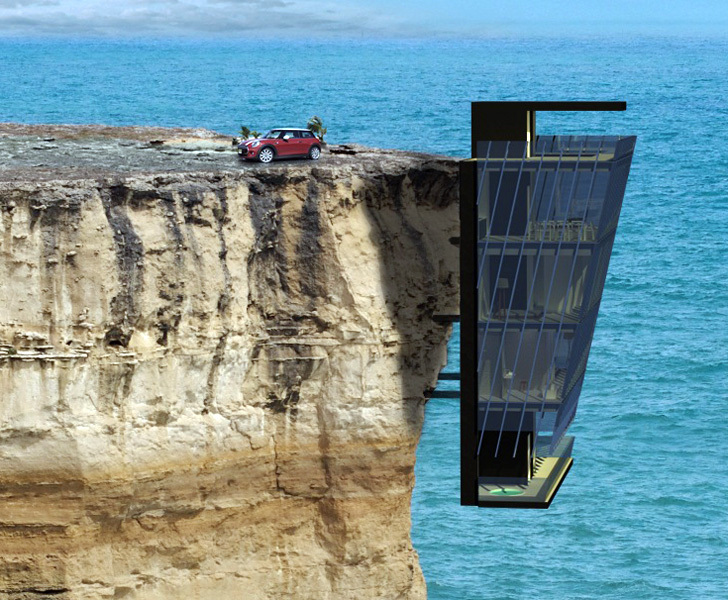 "although still a concept, Cliff House could provide efficient and innovative housing in rocky areas deemed unlivable."